Solve Israel's Problems » Please Share Our Articles » Who Speaks for the Democrats on Israel? The growing number of outright opponents of Israel among party activists has been a concern for years, but still no need for panic. The growing number of critics and outright opponents of Israel among party activists has been a concern for several years. Their increasing prominence has added to the worries of those who worry the Democrats could be going the way of Britain’s Labor Party, which has fallen under the control of radical anti-Zionists, as well as an open anti-Semite like their leader Jeremy Corbyn. But instead of panicking at the prospect of a House of Representatives controlled by the Democrats in 2019, those fearing for the future of the US-Israel alliance should calm down. While the next two years promise to be one of escalating conflict between the Democrats and US President Donald Trump, Israel won’t be part of the argument. Just as important, the election results gave far more comfort to those who wish to keep the Democrats as part of a bipartisan pro-Israel coalition than those who want to break it up. Opponents of Israel will have something to celebrate in January. Both are allied with Alexandria Ocasio-Cortez, a socialist who will represent Queens, N.Y. Ocasio-Cortez said she wanted to end the “occupation of Palestine,” though she didn’t seem able to say whether that meant the West Bank or, as Palestinians define the term, all of Israel. This trio of congressional newcomers is also allied with the Women’s March, whose leaders combine anti-Zionism with a soft spot for anti-Semitic hate-monger Louis Farrakhan, head of the Nation of Islam. We can expect them to unite with other Democrats to undermine the US-Israel alliance, such as the dozens who signed letters last year championed by figures such as Sens. Bernie Sanders (I-Vt.) and Elizabeth Warren (D-Mass.) calling for the lifting of the blockade of the terrorist Hamas regime that rules Gaza. Intersectional ideology, which falsely analogizes the Palestinian war on Israel’s existence with the struggle for civil rights in the United States, has become fashionable in progressive circles. But those running the Democratic caucus are still firmly in the pro-Israel camp. House Democratic leader Rep. Nancy Pelosi (D-Calif.)—and the presumptive Speaker of the House next year—has been a fairly reliable friend of Israel, though not necessarily a fan of the Netanyahu government. The No. 2 Democrat in the House, current Minority Whip Rep. Steny Hoyer (D-Md.) is an even more ardent supporter of Israel who has done his best over the years to keep left-wing members of his caucus in line with respect to the Middle East. Some of the Democrats who will run powerful House committees, such as Rep. Maxine Waters (D-Calif.), are not friendly to Israel. But her leadership of the Financial Services Committee probably won’t cause any trouble for it. On the other hand, other veteran Democrats are in a position to bolster the alliance. The current ranking minority member and presumptive chair next year of the House Foreign Affairs Committee is Rep. Eliot Engel, who represents the Bronx, N.Y. Engel’s views about the Middle East could be fairly described as aligning perfectly with the Likud Party in Israel. He is the last person who would champion an attempt to reverse Trump’s policies, such as cutting back U.S. aid to the Palestinian Authority to force them to cease subsidizing terrorists. The new chair of the powerful House Appropriations committee is likely to be Rep. Nita Lowey (D-N.Y.), another reliable pro-Israel legislator. Just as important is the fact that left-wing foes of Israel received some sharp setbacks in the midterms. Despite the general swing towards the Democrats in Virginia, anti-Israel propagandist Leslie Cockburn failed to win a vulnerable Republican-held seat for the Democrats. Scott Wallace, a left-wing philanthropist who had funded BDS causes, also failed to capitalize on anti-Trump sentiment in his effort to flip a Republican seat to the Democrats in the Philadelphia suburbs. 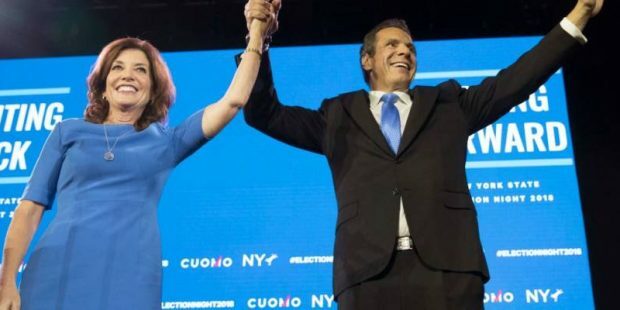 Democrats expanded their numbers throughout the country, but those who ran as unabashed progressives, rather than as moderates in districts and states that were not deep blue, generally failed. Indeed, while the gubernatorial contest in Florida was more of a test of the lingering appeal of the Trump brand, it was also one that pitted a fervent ally of Israel in Rep. Ron DeSantis (who eked out a win) against Tallahassee Mayor Andrew Gillum, who had ties to groups that are critical of Israel. It remains to be seen whether Democrats will conclude that the mistake in Florida and other races was nominating left-wingers, and now look for a presidential nominee in 2020 who is more of a moderate, rather than one who can appeal to the anti-Israel intersectional crowd on the left. But as much as people like Ocasio-Cortez, Tlaib and Omar will get publicity for their cause, the fact remains that most congressional Democrats will be counted among Israel’s friends. Alongside a Republican caucus that is nearly unanimous in its support for the Jewish state, it creates a political atmosphere that is still very friendly to Israel. The future of the Democratic Party with respect to Israel is by no means assured as the party shifts to the left. But for the present, the radical anti-Israel faction remains in the minority, at least as far as Congress is concerned. It will be up to pro-Israel liberals to make sure it stays that way.